On a dark frozen planet where no planet should be, in a doomed city with a sky of stone, the last denizens of Earth’s long-lost twin will pay any price to survive, even if the laser scalpels cost them their love and hate and humanity. And in the mat-infested streets, around tea-time, the Doctor and Nyssa unearth a black market in second-hand body parts and run the gauntlet of augmented police and their augmented horses. 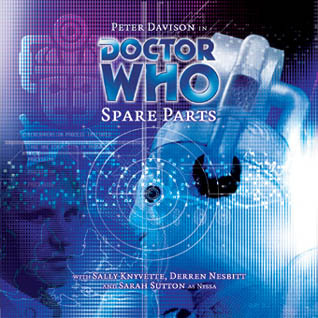 Peter Davison is the Doctor in Spare Parts. Spare Parts heralds the second appearance of these metal monsters in the Big Finish range, having earlier appeared in the Eighth Doctor serial Sword of Orion. While the Daleks are the best known Doctor Who villains, the Cybermen have been a stalwart foe for the Doctor as well, all the way back to the First Doctor serial The Tenth Planet, where the energy drain caused by the destruction of the Cybermen’s home planet Mondas resulted in the very first regeneration (called a “renewal”) as William Hartnell became Patrick Troughton before the astonished eyes of his companions Polly and Ben. Where the Daleks have only one emotion, hatred, the Cybermen have none. They willingly gave up their humanity in order to survive the climate and tetonic changes affecting their home planet, replacing meat with metal and emotion with logic. From there, they decided that their way was superior to the ways of other species, and began a subtle program of conquest and conversion to bring other races into their fold. No one can underplay the impact the Cybermen have had. In many ways, the Cybermen were the precursors to Star Trek’s Borg Collective. 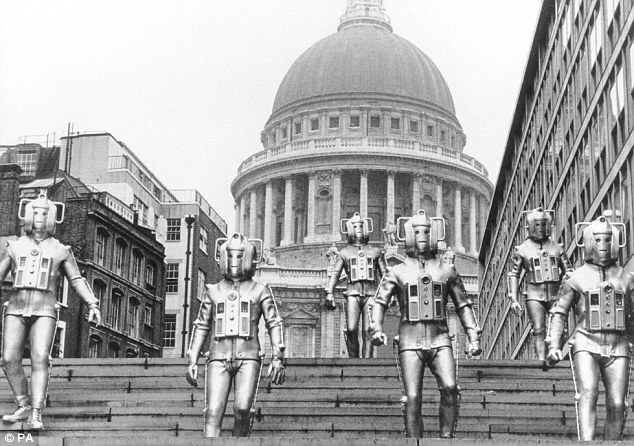 One of the classic images in all of Doctor Who is the shot of the Cybermen emerging from the sewers and marching down the steps in front of St Paul’s Cathedral in the heart of London. The Cybermen were also directly responsible for the death of Adric, a companion of the Fifth Doctor, at the end of Earthshock, in a moment that sent a shock through viewers across Britain. The Cybermen have also appeared in the new series, in episodes such as Rise of the Cybermen/The Age of Steel (which this story is credited with inspiring by episode writer Tom MacRae), Army of Ghosts/Doomsday, Closing Time, and Nightmare in Silver. When it comes to the audio continuity, Spare Parts holds a unique place. It’s often considered to be THE story to recommend to newcomers to the world of Doctor Who audios, simply because it’s one of the BEST Doctor Who stories that Big Finish has ever produced. The previous sentence is not hyperbole. A top-notch script, a haunting setting, strong, desperate performances, and some incredible sound and effect work all add up to an audio play that serves as the “unofficial origin” of the Cybermen. The Doctor is wary. The Victorian city the TARDIS had landed in looks a lot like late 19th century London, but they are subtle differences; an abandoned movie house, electric streetlights that weakly flicker, and a dark stone roof hanging overhead where the stars should be. 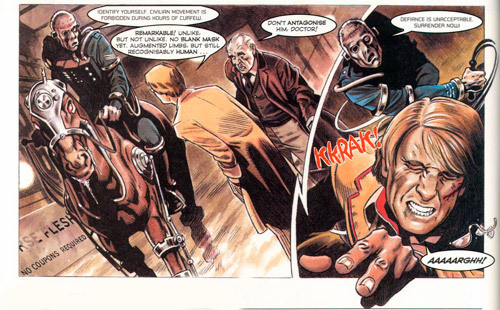 While exploring the city, the Doctor and Nyssa become seperated. Where the Doctor has a run-in with Thomas Dodd, a local “butcher” who accepts fresh organs in return for easy lines of credit, Nyssa ends up a guest of the Hartleys, a working-class family who’s son Frank wants one thing – a chance to join the work crews who are laboring on the planet’s surface in an effort to save the dying planet of Mondas…a planet the Doctor knows all too well, as it is the birthplace of one of his most deadly foes. This is the second script that Marc Platt has submitted for Big Finish, the previous being the Five/Turlough story Loups-Garoux. Platt’s script lays out a city that is familiar enough to the listener that the subtle changes stand out; curfews, residential papers, boarded up business, abandoned houses of worship, and draft animals that have undergone “enhancements” where metal has replaced horseflesh. What’s more unsettling that familiar places where things are just a little bit wrong? It’s here in this slightly-off put setting that the other strengths to Platt’s script come to the surface. The concept of replacing flesh with metal is a common theme in science fiction, and Platt doesn’t waste time on the details of the process. What he does do, however, is use that familiarity with the concept to ease the listener into the serial. The Cybermen will be well known to most listeners. For newcomers, Platt outlines and reveals their story in a manner that quickly catches them up to speed with the horror of the Cybermen without hitting them over the head. Each step of the process of conversion, each twist in the tale, each tightening of the screw, is done in such a way that even those who are familiar with the inevitable events of The Tenth Planet will be drawn in and left hanging on with every reveal. Another strength to Platt’s script are the secondary characters. Doctorman Allen is played by Sally Knyvette of Blake’s 7 fame. Doctorman Allen is trying to ensure the survival of her people and copes by stiff drinking. The listener can see her waffling back and forth between giving up in despair and cynically grasping at straws even as Mondas fades. The Hartleys are an example of the people she is trying to save; a working class family who makes do and carries on, no matter what. Paul Copley as the stoic father who keeps a stiff upper lip, Jim Hartley as the son Frank who wants to do his part by volunteering to join the people working on the surface, and Kathryn Guck as the doomed Yvonne. Also, Derren Nesbitt does his part as Thomas Dodd, a organ legger who realizes just how bad things are, but refuses to see anything past the ability for pure profit. The performances are absolutely stellar, without a drag in the bunch. But the biggest bit of praise goes as such; the actors and actresses play their parts. Much as the underground city reminds the listener of home, the characters are immediately familiar. They may be inhabiting another planet, but they aren’t alien at all; they are us. They are relatable, and as the listener coemes to understand, they are doomed. Once again, I have to give high praise to Sarah Sutton. For as great as India Fisher/Charley Pollard has been alongside Paul McGann, Nyssa has yet to disappoint in any of the serial along side the Fifth Doctor. This serial could have been written for her. Sarah Sutton doesn’t stumble or let up in the slightest, giving what is her best Big Finish performance in the process. Nyssa witnessing the death of Adric has been one of her defining moments in both the television show and in the Big Finish audios. She realizes where she and the Doctor have landed, and instead of letting it haunt her, she decides to do her best to establish hope, even the tiniest bit possible, in an effort to turn Mondas from its path. She defies the Doctor, who says that they can not interfere, not in the slightest, and if the Doctor won’t get involved, then the companion will. Her internal pathos and anger at what happened to both her home planet of Trakken and Adric comes out here, as opposed to being repressed inside where Nyssa usually keeps it. It’s Nyssa’s friendship with the Hartley’s that forces the Doctor into trying to at least do something. Peter Davison has said that, growing up, his favorite villains were the Cybermen. Marc Platt hands him a script that’s absolute gold, and Davison responds with what is also his best performance to date with Big Finish. The Fifth Doctor is dashing, and noble. But when confronted with the origins of the Cybermen, he refuses to get involved. Nothing will change, nothing will get better. This isn’t the quiet Doctor with moments of anger. This is a Doctor who is frustrated, upset, and absolutely willing to not do anything. When he does get involved, it’s not directly. He wants to make it so that the people of Mondas make the choice to turn away. It’s their decision, to make, not his. When push does come to shove, though, Davison’s anger BOILS out of him. He rages at the Central Committee, frustration at Adric’s fate and the unfolding story in front of him leaping through the speakers at the listener. His performance is amazing as the role the Doctor plays in the origin of the Cybermen come to the forefront, as he’s sickened and repulsed by what has happened and what will happened. This was the first Big Finish audio I had the pleasure to listen to, and have listened to it three times as of this review. Davison is just THAT amazing that I pick up something new with each listen. And what of the Cybermen? The Big Finish sound department pulls out all the stops with this one. These Cybermen are “old school,” the buzzing voices heard in The Tomb of the Cybermen, showing their relative age in their development. The listener can tell just how far Mondas has gone and how their society sits on the edge of a cliff as the voices are distinctly inhuman. The sounds of conversion are simply horrifying as well; saws, lasers, ripping, screaming, crying. The clip-clop of partially converted horses and the sounds of a horrified crowd as the Cybermen whip at them and herd them into emergency, mandatory conversion stand out as well. I’ve used the word “Cybermen” a lot in this story, but the people of Mondas are not yet Cybermen. But the script by Platt shows just how they’re one step away from total conversion. The policemen and watchmen may as well be cyborgs inside their metal protection suits. Hearts and limbs are replaced without a care. Even the pets are robotic, with wind-up canaries to sing holiday carols for the Hartleys. The Central Committee are a few nuts and bolts away from being the Cyber-Controller. As I said earlier, Platt eases the unfamiliar listener into the story, but by the end, they will be intimately familiar with the Cybermen if encountered during Saturday television viewing. Already, they speak of survival. “We. Must. Survive.” They demand orders. They follow those orders. Those who are not like them will become them. The final fate of Yvonne Hartley in particular is incredibly soul-crushing, done in a unique way that I did not see coming, which makes it all the worse with how her father reacts. There is no sympathy for the metal monster in this serial. The path Mondas has taken it wrong, and it’s up to the Doctor to ensure they make the right decision. But in the end, will it be the right decision, or the logical decision? Next up – A conference of lexicographers: bromides in tweed. But the leading expert in the field is found dead by her own hand – and by her hologlyphic assistant. Is he responsible? Does the death fit any conventional definitions? Can the Doctor realise who wrote the suicide note and why, exactly, it was riddled with spelling errors? Colin Baker is the Doctor in …ish. This entry was posted in Big Finish Review and tagged 6/5, Big Finish, cybermen, Doctor Who, Fifth Doctor, Nyssa, Peter Davison, TARDIS. Bookmark the permalink.